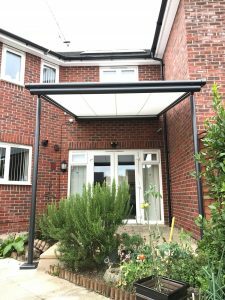 This Markilux Pergola installation was requested for a domestic property in Wickford, near Southend in Essex. The client was looking for a cover to provide sunshine and light rain protection for the whole of her patio area. The size of the area and the shape needed meant that the Pergola was the ideal system. The positioning of the front posts in particular posed a challenge when making and fitting this system. This was because one needed to be higher than the other because of different levels, with one supporting post. 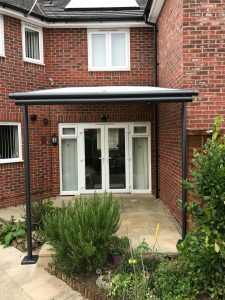 We were also able to position the posts slightly back from the front of the system so that the canopy can hang over the herbaceous planting to deliver rain water rather than depositing it on the patio.